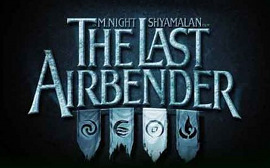 The Last Airbender, a live-action film written and directed by M. Night Shyamalan, is roughly based on the first season of the animated series. Many world & character details have been altered in this adaptation, including the characters' real world based ethnicities and cultures. "Air, Water, Earth, Fire. Four nations tied by destiny when the Fire Nation launches a brutal war against the others. A century has passed with no hope in sight to change the path of this destruction. Caught between combat and courage, Aang (Noah Ringer) discovers he is the lone Avatar with the power to manipulate all four elements. Aang teams with Katara (Nicola Peltz), a Waterbender, and her brother, Sokka (Jackson Rathbone), to restore balance to their war-torn world. Based on the hugely successful Nickelodeon animated TV series, "Avatar: The Last Airbender," the live-action feature film "The Last Airbender" is the opening chapter in Aang’s struggle to survive." This first movie covers Book 1: Water or the first season of the animated tv show. The word "Avatar" was dropped from the movie title due to conflicts with James Cameron's 2009 movie also titled "Avatar." the character races of Aang (now white), the Southern Water Tribe (now white, though background extras are still Inuit), and the Fire Nation (now Indian/Southeast Asian). Limited casting info for the Earth Kingdom points toward being a medley of Asian ethnicities. Almost all character/Nation wardrobes have been altered, most drastically for the Fire Nation -- their clothes are now predominately black and the soldier uniforms are a cultural mixed bag. World changes include the traditional Chinese calligraphy being replaced by a made-up "fantasy" language, and instead of a martial arts consultant, the fight scenes are being coordinated by a stunt choreographer. Firebenders also can no longer create their own fire; they can only manipulate fire that is nearby. In addition, the trailers have Christian overtones surrounding Aang; the tattoo on Aang's back is in the shape of a cross, the trailers narrate Aang as being thought of as "a myth," "the Chosen One," and "His Sacrifice" being "our only hope," while the Northern Water Tribe's cathedral-like sounding bell echoes through it all. A list highlighting all of the changes will be added later on, probably. Written, Produced, and Directed by M. Night Shyamalan. Edited by: Conrad Buff, A.C.F.